For a while it seemed like Jose Guillen was at risk of spending three full years with the same team. From the start of his career, in 1997 with the Pirates, through 2007 he had spend no more than two years and change at any one place. Then, when he became a free agent after the 2007 season, he signed a three-year, $36 million contract with the Royals. After two and two-thirds years, the Royals have designated Guillen for assignment. 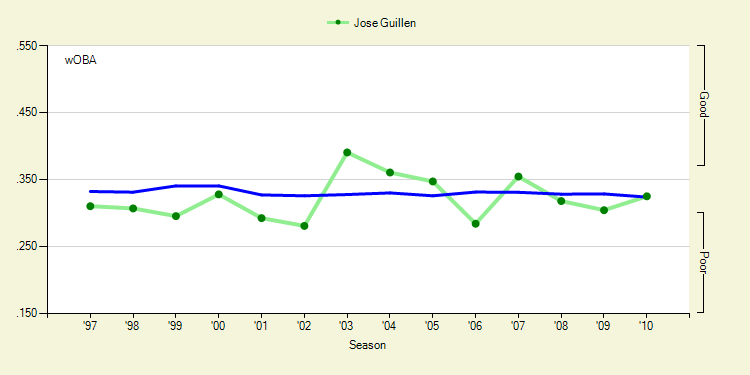 Guillen experienced a breakout season with the Reds in 2003, producing a .423 wOBA through 349 PA to start the season. Cincinnati sat 10 games back in the NL Central at that point, though, and traded Guillen to the A’s in a deal that brought back Aaron Harang. Unsurprisingly he cooled off in the final two months, producing a .330 wOBA in 186 PA. He was set to be be a free agent, and the budget-conscious A’s let him walk. Guillen surged for his new team, the Angels, in 2004, producing a .361 wOBA, including a high, for him, 6 percent walk rate, in 621 PA. Yet his attitude problems got the best of him by season’s end. Following an incident where he showed up manager Mike Scioscia after getting pulled for a pinch runner, the Angels suspended Guillen without pay for the remainder of the season. He ended up missing the playoffs, in which the Angels lost in the ALDS to the Red Sox. The Angels got a return on him that off-season, sending him to Washington in exchange for Maicer Izturis and Juan Rivera, both of whom are still with the team. He had a decent season for the first-season Nats in 2005, producing a .347 wOBA in 611 PA. His 2006 season went much worse, a .284 wOBA, and was cut short when he required Tommy John surgery. He then signed with the Mariners and produced a .355 wOBA in 2007 before signing his three-year contract with Kansas City. On the same day that Guillen’s three-year, $36 million contract with Kansas City was announced, MLB suspended him for 15 games for violation of its drug policy. This was not for a positive test, but instead was in response to evidence that Guillen received shipments of human growth hormone and two types of steroids between 2002 and 2005. Guillen filed a grievance and eventually the suspension was overturned, allowing him to play a full season in 2008. Yet he was back to the production levels of his early career, producing .318 and .304 wOBAs in his first two seasons. He started off the 2010 season hot, a .401 wOBA in April, but as Dave noted, we shouldn’t have expected that to stick. At the time of his DFA he has a .325 wOBA. 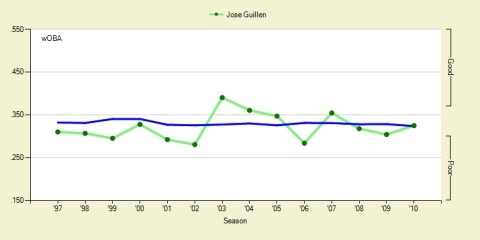 As we can see, a few years gave Guillen the reputation as someone who can produce. Why the Royals signed him to such a large contract I’ll never understand. He was coming off a rebound season of sorts, but even then he was just barely crossing that blue line into the good category. Focusing just on his offensive also ignores just how bad his defense has been. His career fielding component is -59.4 and he has produced a positive number just five times (strangely, including +2.6 this year). This, combined with his mediocre bat, has led to seven seasons with a negative WAR value and another three, including this year, where it was less than one. In only one year of his career, 2005, was he worth as much as the $12 million he has made in each of the last three years. The move to designate Guillen for assignment likely won’t result in his free agency. Plenty of contending teams have worse bats than him, so chances are the Royals will work out a deal to send him somewhere within the next 10 days, probably on the sooner side. With somewhere around $4 million remaining on his contract he’ll certainly clear waivers, opening a deal to any team. The Royals will almost undoubtedly pay most of what remains on the contract. I’ve seen comments saying that this move has come a little too late, but that misses the point that it’s a move that shouldn’t have been necessary in the first place. 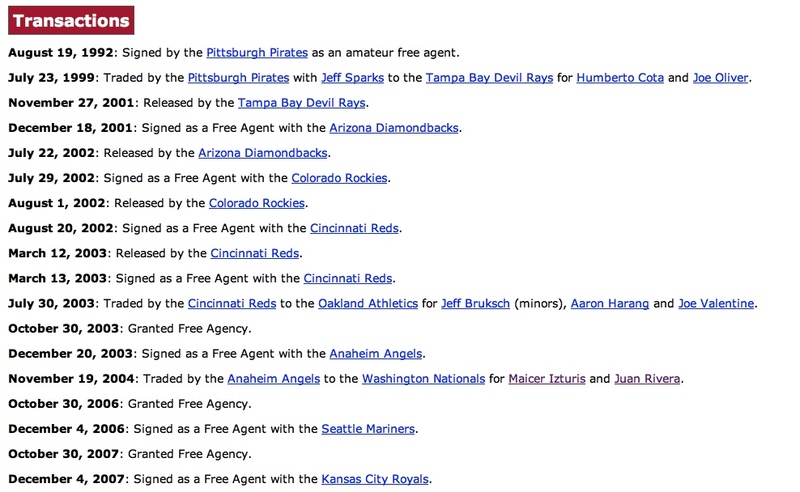 There were zero indications that Guillen would produce value remotely approaching his contract. 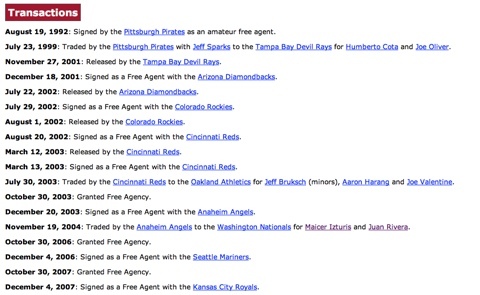 It was a foolish contract signing from the beginning, and the Royals realized nothing from it. His time in Kansas City resulted in -1.2 WAR. If players were compensated with WAR Dollars, he’d owe the club $5.9 million. We hoped you liked reading Royals to Part Ways with Jose Guillen by Joe Pawlikowski! Its unbelievable that he is that bad defensively with that good of an arm. Whoops. Apparently his arm is strong, but not good. Correct. But that can be attributed to little playing time in the OF. His arm certainly was good at one time, and that probably deterred teams from taking the extra base a couple times. His arm was definitely good at one time….